Eleven (born Jane Ives; later Jane Hopper) is a fictional character of the Netflix science fiction horror series Stranger Things. Portrayed by English actress Millie Bobby Brown, she is a girl with psychokinetic and telepathic abilities. Eleven is the daughter of Teresa "Terry" Ives, a participant in the Project MKUltra experiments conducted by the United States Central Intelligence Agency (CIA). Eleven appears to have been born telekinetic. However, the use of her abilities temporarily weakens her and causes her nose to bleed. 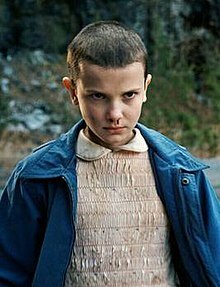 At birth, Eleven was taken away from her mother by Dr. Martin Brenner and was raised in the Hawkins National Laboratory in Hawkins, Indiana as a test subject to develop her psychokinetic skills. When placed in a sensory deprivation tank she can engage in astral projection and access other dimensions, primarily for the purposes of international espionage. Eleven encounters a creature living in the Upside Down dimension, and on the evening of November 6, 1983, she finally makes contact with it. In efforts to make contact, Eleven opens a gate between the Hawkins Laboratory and the Upside Down dimension and the creature gains the ability to travel between the human world and the Upside Down. In the first season, Eleven escapes from Hawkins Laboratory and attempts to steal food from a local restaurant. She and the owner bond, but the owner calls social services. The responding social worker, who turns out to be a Hawkins Laboratory agent, kills the owner. Eleven flees before being taken once again. She is then found by Mike Wheeler (Finn Wolfhard), Dustin Henderson (Gaten Matarazzo) and Lucas Sinclair (Caleb McLaughlin), who are looking for their missing friend, Will Byers (Noah Schnapp). Mike allows Eleven to live in his basement. Fearing recapture, Eleven convinces Mike not to tell any adults about her so the social workers don’t find her. Eleven helps to locate Will using her supernatural abilities, and determines that he is trapped in the Upside Down. The group sets out to find Will using their compasses, but Eleven interferes with their search when she realizes that they are being led towards the laboratory. Lucas, noticing her deception, becomes angry at her (having mistrusted her from the beginning). She flees, steals boxes of frozen waffles from a store, and consumes them in a forest. Mike and Dustin are threatened by bullies where Mike is forced to jump off a high cliff into a river with Dustin being held hostage but Eleven returns, immediately intervenes before Mike is able to jump and saves both Mike and Dustin. Eleven, Mike, and Dustin reunite with Lucas and make amends. They travel to their middle school with Dr. Brenner and his associates in close pursuit. During the chase, Eleven uses her powers to cause a laboratory van to flip through the air. The group is aided by Joyce Byers (Winona Ryder), Police Chief Jim Hopper (David Harbour), Nancy Wheeler (Natalia Dyer), and Jonathan Byers (Charlie Heaton), produce a makeshift isolation tank with a pool and bags of salt. Eleven accesses the Upside Down and confirms that Will is alive. As laboratory personnel close in on the school, Mike tells Eleven she can be a part of his family and asks her to the school dance. He then kisses her after struggling to explain his feelings towards her. Eleven helps the group escape by using her powers to kill most of the agents, although doing so leaves her drained. The monster from the Upside Down makes its way into their dimension, and Eleven seemingly sacrifices herself to destroy the creature and save her friends. One month later, after a Christmas party, Hopper leaves the police station and drives to the woods. There, he leaves waffles in a concealed box. The whereabouts or condition of Eleven are left ambiguous. After defeating the Demogorgon, Eleven wakes up in the Upside Down dimension. She escapes through a portal, leading her back to the school. With the government still searching for her, she is forced to hide in the forest. Eleven eventually finds the Eggos Hopper left for her and seeks him out. The two move into a cabin in the woods where he forbids her to leave, fearing for her safety. Hopper hides Eleven indoors for almost a year, telling no one of her whereabouts, not even Mike. During this time, Eleven gains better control over her powers; she is less weakened by the use of her telekinesis, and she is now able to project her mind without the use of a sensory deprivation tank. She uses the latter ability to listen to Mike's attempts to contact her, though she is increasingly frustrated at her inability to reply. Eleven also significantly expands her vocabulary during this time, learning from both Hopper and television. Eleven becomes restless and longs to reunite with Mike, and this causes tension between her and Hopper. She runs away from home one day and travels to Hawkins Middle School. When she finds Mike, he is with Max, a new student. Eleven mistakenly thinks Max is flirting with Mike and, out of spite, uses her powers to knock her off of her skateboard before leaving. Upon returning to the cabin, she gets into a heated argument with Hopper over her leaving the cabin, ending with her using her powers to damage the cabin out of anger. The next day, cleaning the mess she made of the cabin, she discovers by looking through records in the cabin's basement her birth mother is alive, a contradiction to what Hopper had told her. She then goes to meet her birth mother, Terry, and her aunt, Becky, and discovers what happened to Terry at Hawkins Laboratory. While there, she realizes Terry is trying to talk with her, but due to her catatonic state, is unable to. Eleven, using her powers, views a flashback from her mother. Terry, after her daughter was taken from her, attempted to force her way into Hawkins Lab to save her. As a response, Brenner and his assistants captured her and subjected her to electroshock therapy, resulting in her current condition. Eleven then uses her abilities to find out she has a "sister" – another gifted girl taken by Dr. Brenner for experimentations – and sets out to find her. Using her abilities once again, Eleven locates her sister and discovers that she is an older girl named Kali ("Eight"), with the ability to cause people to have visual hallucinations. Eleven stays with Kali and her friends – runaways who are determined to take revenge on people who have hurt them. Kali tells Eleven that while using her powers, she needs to think about what makes her most angry. When they go to get revenge on Brenner's assistant who helped hurt Eleven's mother, Eleven begins to choke him to death but stops upon realizing that he has two daughters. She then stops Kali from shooting him. Back at the hideout, Eleven witnesses Hopper and Mike in danger through the void. While the gang are about to flee, Eleven realizes she needs to go back to her friends because they need her help. Eleven goes back to Hawkins and finally reunites with Mike with a heartfelt embrace and her friends after saving them from a Demodog. The group realizes that she needs to close the gate to the Upside Down, and she and Hopper head to Hawkins Laboratory. There, Eleven uses Kali's advice and focuses her anger into her powers, closing the gate and draining her powers. Afterward, it is discovered that Dr. Owens has forged a birth certificate allowing for Hopper to become her legal adoptive father as a way to help keep Eleven in hiding. Eleven's new legal name is Jane Hopper. Hopper lets her attend the Snow Ball at Hawkins Middle School. She meets up with Mike, dances with him, and they share a second kiss. The Duffer Brothers originally based the character of Eleven on survivors of the Project MKUltra experiments, with influences from E.T. and the idea of being an outsider. They also drew inspiration from the animes Elfen Lied and Akira, saying they "wanted there to be a mystery in her past, and also have her seem a little scary." Originally, Stranger Things was pitched as a limited series, and it was planned that Eleven would sacrifice herself in the last episode of the series. However, Netflix were keen for the show to be continued in a second season, and so the brothers decided to keep the character alive. Of all the roles on the show, the brothers felt it was most difficult to cast Eleven. As the character had few lines, they wanted a child actor that was able to convey lots of emotion. The Duffers were concerned that they would not be able to find anyone who could stay in character in scenes where they were not talking. However, the brothers were relieved after meeting Millie Bobby Brown, who they described as "something special, alright, with a downright spooky preternatural talent." Brown had to get a buzz cut for the role. Initially she and her parents were worried about this, although after she was shown a photo of Charlize Theron as Imperator Furiosa she agreed to getting her hair cut. Millie Bobby Brown's performance has been widely praised. The character and Brown's performance have received critical acclaim; Alice Vincent of The Daily Telegraph wrote that "Millie Bobby Brown continues to be the star of the show: she has inspired fan art and tattoos, a worldwide acknowledgment of Eggos, the waffles her character devours and given a whole new life to the phrase 'mouth breather'". Ashley Hoffman of TIME magazine recommended Eleven as a mascot for National Waffle Day. However, Lenika Cruz of The Atlantic stated that "despite a rich backstory, Eleven is the show's most thinly sketched protagonist". At the 69th Primetime Emmy Awards in 2017, Brown received a nomination for Outstanding Supporting Actress in a Drama Series. At the 2017 MTV Movie & TV Awards, she was nominated for Best Hero and Best Actor in a Show, winning the latter award. She won Best Performance by a Younger Actor in a Television Series at the 43rd Saturn Awards. She was twice nominated for the Screen Actors Guild Award for Outstanding Performance by a Female Actor in a Drama Series in 2017 and 2018. She won a Kids Choice Award for Best Female Actor in 2018. ^ Berkshire, Geoff (July 18, 2016). "'Stranger Things' Finale: Duffer Brothers Talk Cliffhangers, Death and Season 2". Variety. Retrieved October 16, 2016. ^ Stephens, Emily (July 29, 2016). "On Stranger Things' season finale, promises are made to be broken". The A.V. Club. Retrieved October 16, 2016. ^ a b "'Stranger Things': The Duffer Brothers explain how they found Eleven". EW.com. Retrieved 2018-11-04. ^ "'Stranger Things' creators explain it all about season 1". UPROXX. 2016-07-27. Retrieved 2018-11-04. ^ McLevy, Alex. "Stranger Things almost killed off Eleven in season 1, but not for a stupid reason". The A.V. Club. Retrieved 2018-11-04. ^ Vincent, Alice (September 24, 2016). "Eleven out of 10: how Stranger Things star Millie Bobby Brown charmed the world". The Daily Telegraph. Retrieved October 16, 2016. ^ Hoffman, Ashley (August 24, 2016). "Why Eleven From Stranger Things Is the Perfect National Waffle Day Mascot". TIME. Retrieved October 16, 2016. ^ Cruz, Lenika (July 26, 2016). "Where Stranger Things Loses Its Magic". The Atlantic. Retrieved October 16, 2016. This page was last edited on 24 April 2019, at 18:03 (UTC).